The Choice oftop shooters worldwide! ULTIMA CPXII sights feature a revolutionary system eliminating backlash and play in the elevation adjustments: the ZPE system. A readjustable aluminum wedge, secured with Nord-Lock® washers, eliminates any gap between the threaded locking block and aperture block. 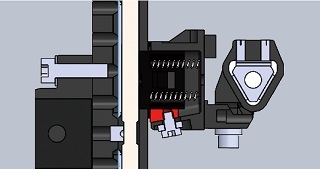 The new flat-shelf indicator pin on ULTIMA CPXII sights is easy to adjust, closer to the sight tape surface than ever before, while still offering enough clearance for layered tapes. Both side pins are locked by a cap screw from the side, preventing accidental movements when locking them down! 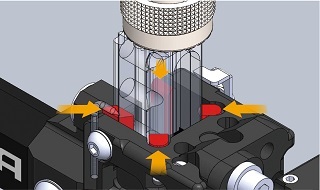 Shibuya's innovative Tria-Lock system keeps the scope rod approx. 1/2" closer to the elevation bar than conventional target sights. This significantly reduces moment effected on the windage unit – a significant factor in development of play and faults! The innovative new Tria-Lock system encloses the scope rod holder from three sides, keeping it perfectly aligned and without play to produce a rattle-free, zero-tolerance environment. 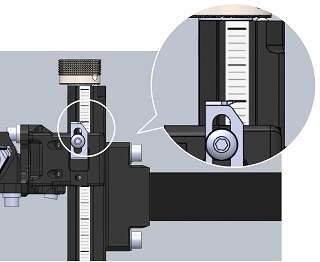 Re-adjustable, zero-tolerance fit between the windage unit and sight frame. 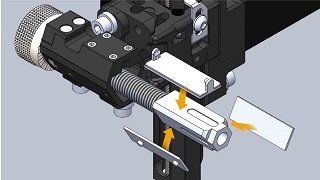 Super-slick and durable polyacetal resin guide spacers enclose the elevation rail, re-adjustable at the turn of a set screw. All parts field-adjustable and -replaceable!